It was still dark when I arrived at the cabin Alicia and Zach had rented near downtown Estes Park for their elopement in Rocky Mountain National Park. When they finished getting ready in separate rooms, we started our drive to the top of Trail Ridge Road, where they were going to have their first look. Alicia and Zach had never been to Trail Ridge Road; they saved that first awe inspiring look for the day of their wedding. As we drove, Zach was so inspired by the height of the cliffs on the side of the road and no guardrail. We made it to the top just as the sun was starting to rise and the most perfect light was bathing the mountainside. They saw each other for the first time in, as Alicia and Zach put it, the most beautiful place they’d ever seen. As we explored the mountain top together, the fog and clouds and one of the most incredible cloud inversions I’ve ever seen rolled into the valley below. Cloud inversions occur at high altitudes where you’re literally above the clouds. 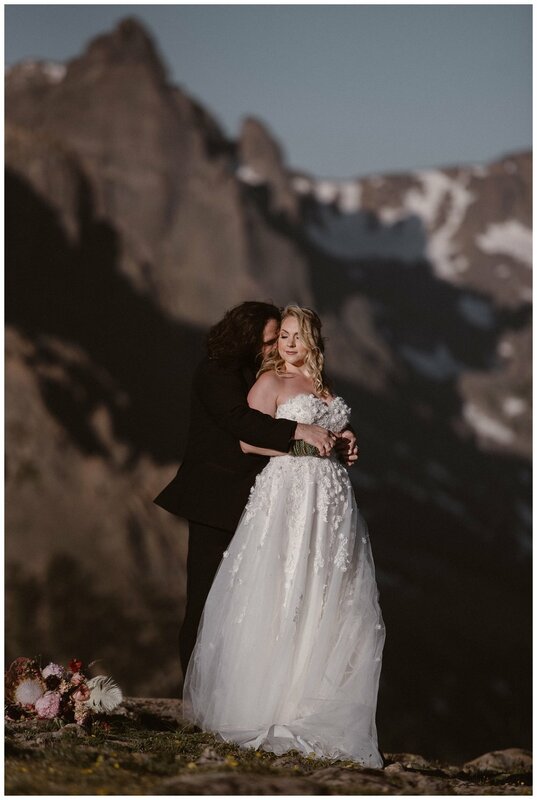 They make for some of the most magical photos and Alicia and Zach looked like they were on top of the world as the clouds hugged the valley. Every time I look up during a really cloudy, moody, grey day, I imagine what it’s like above the clouds at a high elevation like Trail Ridge Road. Even if it looks grey down here, at high elevation it’s sunny and beautiful. It’s a change in perspective and that’s why I love elopements on top of Trail Ridge Road. High elevations have a top of the world environment that changes your perspective and it’s an incredible thing to experience with couples on their wedding day. 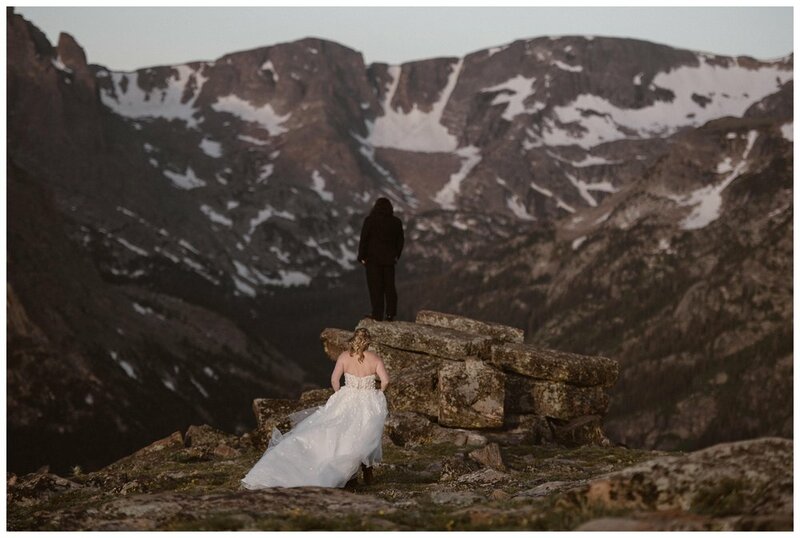 I think a huge reason couples elope at national parks or in scenic wilderness areas like Trail Ridge Road is to be not only connected to each other but also to feel connected to nature. They want to experience something awe inspiring and be in places that make them feel small. I also firmly believe more couples should do something new together on their wedding day. Alicia and Zach faced the cold, the elevation and the slippery rocks together. It was amazing to see them have this new experience together. To have a totally new adventure together and have no expectations about it creates such a lasting memory. Once we finished Alicia and Zach’s couple portraits, we drove back down through the clouds to meet their families at 3M Curve inside Rocky Mountain National Park for their ceremony. The drive was low visibility and foggy but very magical. Just six family members met us there and Alicia and Zach had a beautifully heartfelt and intimate ceremony. 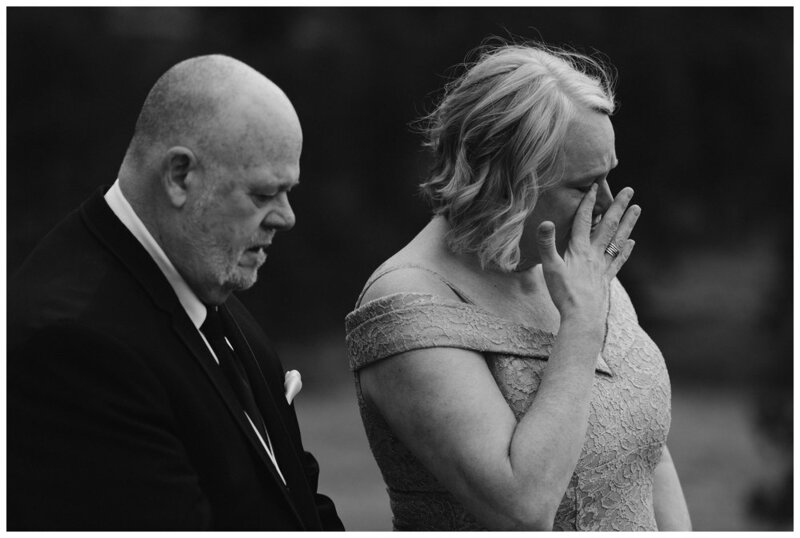 When the people closest to a couple also get to be a part of their wedding day, the emotions and love runs very high. It’s inspiring to be in the presence of that and it was clear that everyone surrounding Alicia and Zach wanted them to have the best possible day. Alicia’s mom gave a beautiful heartfelt toast of Italian food at their cabin. 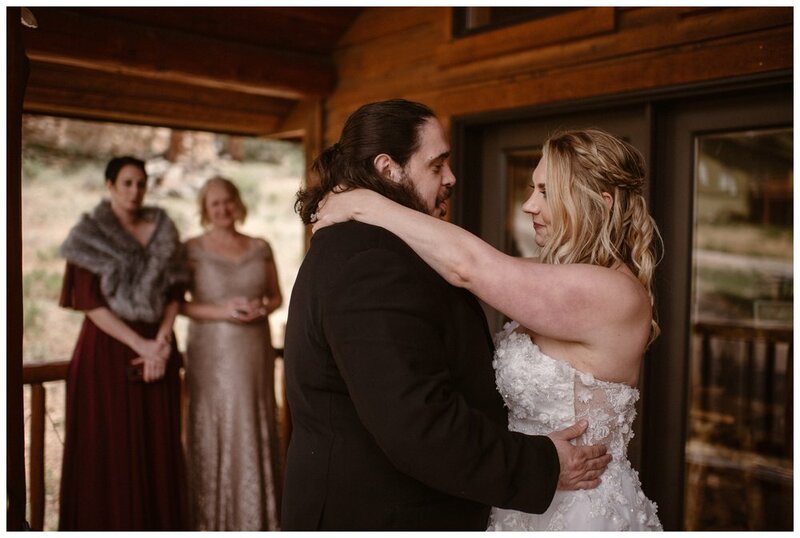 Their first dance was on the balcony of the cabin with the most amazing views of the mountains. We got very lucky with the weather that day; it only rained when we got inside. Not a drop of rain on them. Alicia and Zach are some of the most kind, generous and loving people and it was an honor to be a part of their day. Explore our Rocky Mountain National Park Wedding Photography packages. Let us help you craft the most meaningful day of your life.